I'm also trying to dig into Shepard's work. Dave (or anyone else) - what's the relationship between an "ecoregion" and a biome? Really what I'm trying to figure out is how to use this information. My farm is in Granite Falls, WA - so definitely coniferous if it was left to be feral. However, I heard there is evidence that before the plagues wiped out the local native populations, most likely people maintained a deciduous forest biome, not a coniferous. My understanding is our climate can support either, but one has more food. The wild areas will grow woody fuel with no effort. I've also heard sadly our Big Leaf Maples - mostly much further west - are in decline and biologists don't know why. If for no other reason than diversity, it might be good to put in more deciduous plants. No. The opposite - input should be slightly larger than output. Mr Teslonian covered it in the video I linked. Then again he's combining two machines together. But it makes sense to me. You're trying to encourage water to swirl and input a large volume on the way in, but create to a small degree a bottleneck on the way out, forcing the pressure to increase. Do you have one-way values in place to prevent backflow (Mr. Teslonian mentions several key places where he put them)? Is your input both a wider pipe and at least a few feet higher (sounds like 3 feet may be sufficient) than your output? There was a great suggestion about optional ideas you could do with straws to help create a swirling affect when the water flows down, which will add more air bubbles: put the straws slightly offset from each other. So for example if you had 6 straws, inside the inbound tube, have the base of the straws be at different heights, maybe each one 1" apart from each other inside of the pipe. You could use a simple spacer to help hold them in place - think maybe a tin can lid with holes. This is the first time I've run into this guy on youtube. It's very inspiring to see his stuff put together. As a side note, it looks like he has some serious welding skills. If you truly do succeed, be careful to think through where your weakest point is in your system. Unfortunately I don't know of a point of reference - this volume of water falling this distance can produce X amount of pressure. However, I feel like there are a few components you could try modifying. 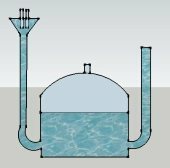 Could you try reducing the size of your reservoir where the air gathers at the bottom? The air will still want to collect, but if it's forced into a small space, it may compress further. Similarly, could you try to introduce more air on your inbound? For example, attach a funnel shape with many straws instead of just one? Have you seen Mr. Teslonian's video? BTW this is great of you to share your project! Much appreciated. That or you consider it a seasonal form of energy, when you have running water. You don't need an elevation drop, if I'm understanding the physics. You could just bury the equipment. You just need the elevation drop from the input to where the tank is that is collecting bubbles. I just wanted to clarify, because I just watched Mollison's lecture. He was talking about diverting water from a stream or river, so no need to haul water up to an elevation. He even mentioned that the outbound water has more dissolved air than when it was received, so it was good for wild fish. I could not verify all of his claims. In particular it seems like it could power something like a car, but significantly less horsepower and maximum speed than what we think of as a car. For example, the technology might not be able to scale to replace a pick up truck that could haul horses and gravel. But you could use it to go grocery shopping and perhaps 70 kph. If you have a farm, hobby farm, even an urban farm and you wish you had a website, this post is for you. Even if you have a website for your farm, and you're looking for an inexpensive way to take credit card sales, please check this out. Barn2Door.com is a platform SPECIFICALLY designed for very producers to sell their products. But not just anyone, but those who share our values - that farms shouldn't be running with synthetic insecticides and pesticides, and animals should be treated humanely. We should be celebrating the story of every farmer, helping to be a part of bringing back that relationship, that history behind our food and the connection to our community. It's more than just exchanging money, the value is more than the product, more than a picture and a price tag. Feel free to read our mission. Maybe you've heard of us and you've got some questions, feedback, or suggestions. Feel free to message me directly on the forums, or send an email at hello@barn2door.com. This spring only, we've got a special promotion - the free trial period is extended for early bird sign ups. Instead our standard one month free, there are no subscription fees until May 1 - basically 2 months free. There's no hassle or commitment to try - no payment information required to start selling. We only request payment at the end of your free trial if you wish to continue. The subscription fee is $10 a month (or pay annually and it's even less). It's not a mark up model, so your costs are small and consistent, and priced for small producers - like you! If you're curious to hear a little more about my story: It's really hard for me to boil down my passion into such a short space, but here goes. I believe small farms and gardens are critical for society, our health, well being, our future. As such, I just want to be an advocate for small farmers, and maybe one day I'll get to farm and homestead myself full time, too. I founded a fledgling farm with my partners Janessa and Skyler we named "Trillium Farm" a couple years ago, out in Snohomish County of Washington. 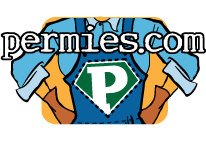 Obviously we're big fans of permaculture since you see me writing here. I hope that our farm will not only be a sustainable place that grows food, but also a source for medicine, raw materials, help people connect with nature and their bodies, but especially reaffirm the value of human labor and animal-human parternships, both wild and domesticated. I'm also incredibly interested in homesteading and natural building, and am looking forward to our first cordwood project. Right now I'm trying to ensure my farm's financial security by continuing with a full time city job and some farm management on the side. Even though my barnheart cries out to be outside, I'm thankful for the opportunity to bridge two worlds and use my software engineering "powers for good" and permaculture ethics to be a positive influence at work.